As promised, here’s the conclusion to a competition that has cost me some sleepless nights: the best texts of the second semester of my final undergraduate year. I narrowed the competition down arbitrarily to five, and each one is a masterpiece in its own way. But now it must end. Along the way we’ve laughed, we’ve cried, we’ve debated the validity of such a competition. Validity, however, is not something I will allow to get in the way of a good old-fashioned book fight. My choices are posthumously approved by Dr Samuel Johnson, so no disagreement allowed. I choose George Owell’s Coming up for Air (1939). How did I know this was the right choice, when it so betrays my love for Doyle and Wilde? I think the fact that I was even considering it along with Sherlock Holmes and Dorian Gray, two long-established favourites of mine, vindicates its potency. As for Christie, I will in no way say that knowing the ending spoils The Murder of Roger Ackroyd, and in fact it makes for a very interesting second reading — but what then? Can we honestly relive The Sixth Sense? As for Joe Orton, he’s just unlucky. It’s no shame to lose out to Orwell. The greatest strength of Coming up for Air is that it is an utterly nostalgic story told with great pragmatism and realism. Orwell was the master of this art. Some authors have a conversational style, but few manage to convince the reader that they’re actually in a conversation as — I believe — Orwell does here. His perceptiveness is astounding, and not just in regard to his extremely accurate visions of World War, Cold War, totalitarianism, brutalism, surveillance culture, and commodification. Nobody who’s read Animal Farm or Nineteen Eighty-Four is going to be disappointed by this work. I said I’d do something else too. I said I’d decide this very week upon my vote for the greatest text of the entire course. This doesn’t mean a choice that can only be taken from my previous semesterly winners either. Voting for the best text on a three- (or for me, four-) year course is completely different from voting for the best one in a certain semester. The parameters are completely different, and therefore so is the winner. Wow. The greatest text of an English degree. That’s not so different from trying to decide the greatest text in English literature. What a burden. The result could make Chaucer fall off his horse. It could make Marlowe and Shakespeare sweat in their ruffs. Alexander Pope would certainly reach for his polemic pen. Emily Brontë might start to reconsider that stupid plot twist with the Rivers family. Dickens would have even more cause for insomnia. None of these giants get my vote. 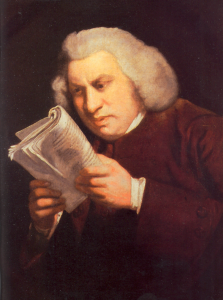 Dr Johnson sure is good at breaking up a page. Gulliver’s Travels, a.k.a. Travels into Several Remote Nations of the World. In Four Parts. 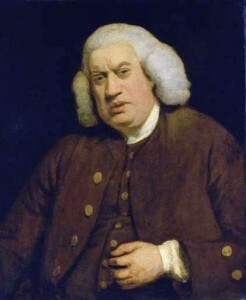 By Lemuel Gulliver, First a Surgeon, and then a Captain of Several Ships, by Jonathan Swift. That’s my vote for the best book, or perhaps the greatest, or at least my favourite (right now). I don’t think this kind of competition calls for something as heavy as Tennyson, or character-building as Dickens, or subtle as Austen, or opulent as Shakespeare. This competition calls for a book you can pick up and laugh with — a book that can make you laugh at near-three-century-old satire as if it had just shown up in The Onion. Gulliver’s Travels has satire for every occassion. I think if I had to be one of those people who carry a certain book with them everywhere, and there existed a copy of Gulliver’s Travels where the footnotes could be condensed into a pocket-sized edition, it would be this one. Not sure I’d trust Swift to take a bullet for me though. So that’s the end of this strange saga. Next week I’ll be looking at some less cebebral (but no less literary) concerns. Oh, and if you have any opinions on an alternate choice for the greatest text in English literature, feel free to post it in the comments. I’ve locked away my polemic pen.